Route directions to Robin Uitgaansmode by car or public transport. Do you want to visit us in Amsterdam Center? We give below the possibilities to reach our shop. Robin Uitgaansmode is easily accessible by public transport and by car. There are two parking garages close by, which have a fast connection with the ring of Amsterdam. Closed on sundays, monday and holidays. - From Amsterdam Central you take tram lines 4 (to station RAI) or 14 (to Flevopark) and get out at Rembrandt Square. 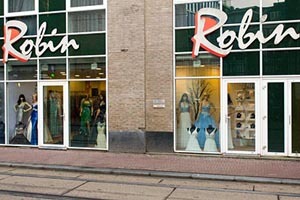 From here it is a 1 min walk to our store in the Amstelstraat. Pay attention!! Traffic situation has changed, the Amstelstraat and Rembrandtplein are no longer accessible from the Utrechtsestraat. Take exit 12 Amsterdam Centrum - Duivendracht (S112) and turn left (follow signs for Centrum). At the roundabout take the first exit to the Wibautstraat (S112). Then continue straight ahead until the Mr Visserplein, turn left towards the Waterlooplein. You can park directly in the Stopera or drive straight across the Blauwbrug to the Amstelstraat for parking in The Bank. - Staying in Amsterdam for a long time and you want to park cheaper, do this at one of the P + R locations on the outskirts of Amsterdam. Park your car for € 8.00 per 24 hours (after 10.00 for € 1.00 per 24 hours) and travel by public transport to the center. First read the conditions on the site of the City of Amsterdam.